Energy storage devices are a crucial area of research and development across many engineering disciplines and industries. While batteries provide the significant advantage of high energy density, their limited life cycles, disposal challenges and charge and discharge management constraints undercut their effectiveness in certain applications. Compared to electrochemical cells, supercapacitors are charge-storage devices with much longer life cycles, yet they have traditionally been hobbled by limited DC voltage capabilities and energy density. However, recent advances are improving these issues. This book provides the opportunity to expand your knowledge of innovative supercapacitor applications, comparing them to other commonly used energy storage devices. It will strengthen your understanding of energy storage from a practical, applications-based point-of-view, without requiring detailed examination of underlying electrochemical equations. 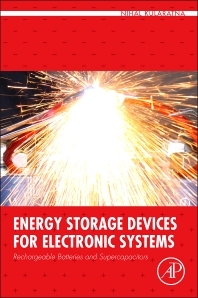 No matter what your field, you will find inspiration and guidance in the cutting-edge advances in energy storage devices in this book. Includes examples of circuit designs that optimize the use of supercapacitors, and pathways to improve existing designs by effectively managing energy storage devices crucial to both low and high power applications. Energy, chemical, electrical and power engineers; electronics product designers; graduate students; research engineers and professionals in energy, electronics and automotive industries.